The Celtic languages are a group of languages, spoken in the west of the island of Britain, in Ireland and in Brittany (north-west France). Their respective names are: Irish, Scottish Gaelic, Manx, Welsh, Breton and Cornish. They are divided into two branches – P-Celtic and Q-Celtic. These labels come from the word for “head” in each of the languages. In Welsh, Breton and Cornish, the word for “head” is pen or penn (and thus these three languages are known as P-Celtic). In Irish, Gaelic and Manx, the word for “head” starts with c- or k- which historically would have been *kw – in Proto-Celtic, and thus we call these languages Q-Celtic. The two branches are also known as Brythonic (Welsh, Cornish and Breton) and Goidelic (Irish, Gaelic and Manx). Welsh has the highest number of speakers according to the British census of 2011, with 19% (or roughly half a million people) of the population of Wales able to speak Welsh. Irish has approximately 70,000 speakers in the traditional Gaeltacht areas of the Republic of Ireland, but all pupils at school have to take the language as a compulsory subject. 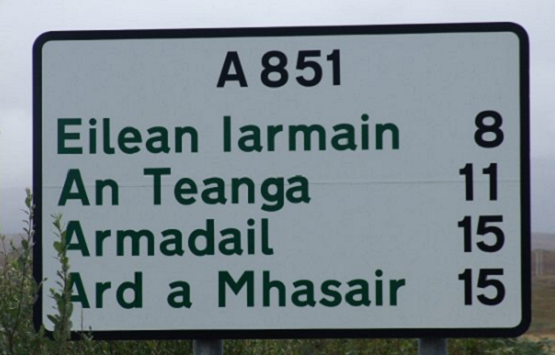 There is also a growing number of Irish speakers in Northern Ireland (UK). Gaelic is traditionally spoken in the west of Scotland and the Island. Breton has approximately 172,000 speakers, but no real official status in France, unlike Welsh, Gaelic and Irish in the UK and Irish in the Republic of Ireland. Manx and Cornish are revived languages – they are taught to children and are learned by adults on the Isle of Man and in Cornwall. All of these languages are considered (severely) endangered. The Celtic languages are the indigenous languages of Britain and Ireland. Brythonic spread to present-day north-west France in the 6th century CE in the wake of the Germanic invasion of the Island of Britain, where Breton developed. Welsh is still spoken by a small number of people in Argentina (Patagonia) where Welsh colonists settled in the 19th century and the Atlantic provinces of Canada (particularly Nova Scotia and especially Cape Breton) still have native speakers of Gaelic. All of these languages are undergoing revival and revitalization efforts. Read more about language revival and revitalization in the Book of Knowledge (Chapter 9). See the website: Cainnt mo Mhathàr (http://www.cainntmomhathar.com/) for recordings of native speakers of Gaelic on Cape Breton Island, Nova Scotia, Canada. ROAD SIGNS ON THE ISLE OF SKYE, SCOTLAND. 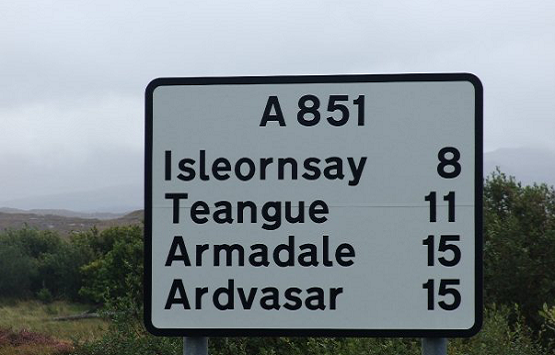 Both signs stand a few metres apart on the same road on the Isle of Skye, and in fact, give the same information. However, they are unusual in that multilingual signage that is appearing in many parts of the world tends to put two or more languages on the same sign. These signs are also unusual since the Gaelic sign comes before the English one. Many multilingual signs tend to put the dominant language first.